Conventional advice for health-related problem is to, "open the lines of communication" and "talk it out." However, adults with aphasia have diminished communication abilities that may impact their reading, writing, and speaking skills. As such, the main way to adjust and/or deal with the new chapter of life is unavailable or very frustrating. Despite language and communication hurdles, there are ways that family members can help their loved one with aphasia as well as helping themselves. In fact, aphasia organizations around the U.S. are major advocates for the Life Participation Approach to Aphasia (LPAA), which encourages individuals facing this diagnosis to find unique ways to connect with their family, friends, and communities. One of the best ways to re-engage in a low-pressure social environment is an aphasia or stroke support group. Here are some tips to help you get started. 1. 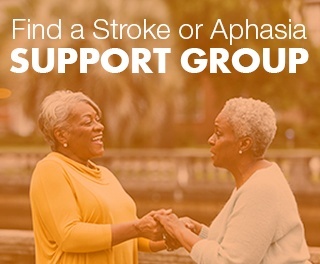 National Organizations: Caregivers or family members can find a support group by connecting with the national organizations for aphasia and stroke. The National Aphasia Association and the American Stroke Association have amazing online portals to help caregivers and stroke survivors or adults with aphasia find a local support group. 2. Community Groups: Many libraries, hospitals, churches, or senior seniors host aphasia and/or stroke support groups that are free and open to the public. Attendees simply connect with a contact person or call the facility to find the next support group meeting. 3. Ask your Speech Therapist: Speech therapists are often knowledgeable about local support groups who may meet about aphasia, caregiving, or stroke. Don't be shy! Ask your speech therapist if he or she knows about any nearby resources. If you are working with a physical or occupational therapist, he or she may also know of a group that meets. If you aren't working with a local therapist, try calling your local rehabilitation facilities to see if they offer a group. Looking for more caregiving resources? Learn about our 12 Tips for Successful Communication with a Person Who Has Aphasia! 4. Social Media: If you or your loved one isn't ready to venture out to a support group meeting, many groups meet and/or talk in forums on social media. One of the largest aphasia groups called, Aphasia Recovery Group, has more than 4,000 members in their closed Facebook group. Members encourage and support each other as they go on job interviews, start physical therapy, and attend parties. Aphasia Recovery Connection also holds regional events across the country that include an aphasia boot camp and aphasia cruises. By joining the online group you can receive the latest information. TalkPath News Group, is another closed Facebook group available to stroke survivors and caregivers. The group is run and moderated by Lingraphica. We encourage members to share hope and inspiration, thoughts, cares, concerns, ideas, jokes, and a few laughs. 5. Find an Aphasia Center: There are 17 aphasia centers in the United States. These centers specialize in post-stroke, aphasia rehabilitation. You can find the entire list of aphasia centers here. 6. University Clinic: Universities with graduate programs in speech and communication sciences or speech-language pathology often offer discounted speech therapy and/or caregiving resources. These sessions are often times heavily discounted or free. To find a university clinic in your area, search Google for "speech-language pathology graduate programs near me." Call or contact the clinic to find out if they offer services. Recovering from aphasia is a life-long journey that requires patience, resilience, and lots of research. New support groups, treatment options, and aphasia resources appear on the Internet and in the marketplace every single day. Check back on our blog or Facebook Page to find the latest news and updates about aphasia. If you need more help, you can always call our team at 888-274-2742. Click below to learn about our 12 Tips for Successful Communication with a Person Who Has Aphasia!